The Archiepiscopal Museum of Ravenna constitutes an important cultural institution of the city. Its origins are deeply connected with the history of the ancient Basilica of Ursus which was rebuilt in the seventeen thirties. In 1734 the Archbishop’s Revenues, under the episcopacy of Farsetti (1727-1741), initiated extensive rebuilding works which definitively changed the appearance of Ravenna’s cathedral. On that occasion numerous ancient finds were unearthed, mostly inscriptions which formed the floor of the ancient Basilica and that the archbishop wanted to collect in a museum “for the public benefit”. From the 18th century to the present day the museum has been enlarged with more exhibition areas and extended with collections that represent numerous interesting fields of interest. Although the museum started as a lapidary – still its main function in terms of quantity of epigraphic material – over the years it acquired liturgical furnishings (including the unique and remarkable ivory Throne of Maximian), a small picture gallery and some medieval mosaics. Inside the building something to remind that the museum was housed in the episcope of Ravenna is the Archiepiscopal Chapel of Sant’Andrea commissioned by Archbishop Peter II (494-519). While the varied and interesting tours may fascinate the visitor entering the absorbing journey through the centuries of Christian history, we would like to direct the reader’s attention to one in particular – perhaps the most original – which guides the visitor in discovering the figure of Saint Apollinaris (II century), the first bishop of Ravenna’s church. On the second floor of the museum, in the socalled Silver Crosses Room, we can admire the processional cross by the master artisan Andrea, a magnificent example of the goldsmith’s craft in the 14th century. The images extend on two sides and depict a crucifix and Saint Apollinaris. Located on the front, at the top, is the figure of the Blessing Christ holding the codex of the gospel, while at the ends of the cross we see the Lady of Sorrows, Saint John the Evangelist and Mary Magdalene. Equally interesting is the back of the cross where the symbolic images of the four evangelists frame the figure of the first bishop. The image of Apollinaris, here united with the mystery of the cross, recalls the iconography of the saint present in the halfdome of the apse of the Basilica of Sant’Apollinare in Classe where the first bishop, depicted here in liturgical raiment and in a praying posture, is associated in the celebration of the Eucharist with the glorious mystery of the passion, death and resurrection of the Lord Jesus. The medieval room contains a lavish planet donated by the archbishop Vincenzo Moretti (1871-1879) in memory of the 18th centenary of the martyrdom of Saint Apollinaris, solemnly celebrated in 1874. The gift was offered by the Cathedral Parish Priest of Ravenna, the Canon Gioacchino Bezzi. The red planet, a colour reserved for martyrs, is richly decorated with gold embroidery. At the centre there is an image of the first bishop with iconography inspired by the apse mosaic of Classe, in which he is depicted praying with his arms raised and hands upturned toward the sky, with the pallium and habit adorned with numerous golden bees. In the Picture Gallery Room there is an altarpiece by Baldassarre Carrari (Forlì, active from 1489 to 1516), depicting a holy conversation; at the centre of the panel there is the Virgin seated on a throne amid the saints Matthew and Katherine, and the Saints Apollinaris and Barbara. 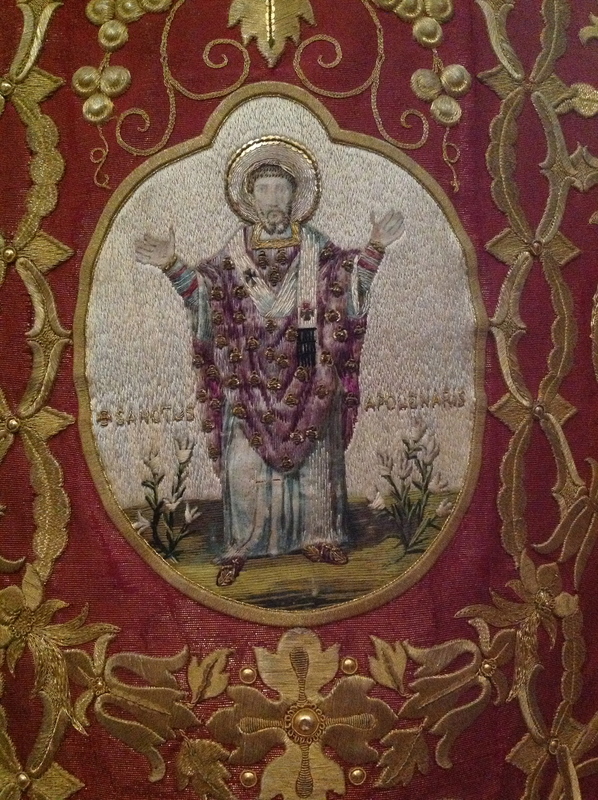 Saint Apollinaris wears a sumptuous cope closed by a gem studded clasp decorated with an image of the face of Saint Peter to indicate his Petrine mission as the first bishop of Ravenna. A beautiful mitre decorated with gems and embroidery adorns his head, his left hand holds a crosier, his right an open codex and both hands wear bishop’s gloves and rings. In the same room we can admire a small canvas by Felice Giani (1758-1823), one of the greatest exponents of neoclassicism. The picture recounts how Peter Chrysologus, deacon of the church of Imola, was chosen for the bishopric of Ravenna. The Liber Pontificalis Ecclesiae Ravennatis, an extremely important 9th century document written by the priest Andreas Agnellus and which collects the lives of the bishops of Ravenna, in the episode dedicated to the life of Chrysologus, recounts how Pope Sixtus III dreamt that he saw Saint Peter and Saint Apollinaris advising him to elect the deacon of Imola, Peter Chrysologus: «During the night the blessed apostle Peter, holder of the keys, appeared to the Holy Father Sixtus together with his disciple Apollinaris and between them stood the blessed Peter Chrysologus; moving near the blessed apostle Peter said to Pope Sixtus: “See the man between us and whom we have elected: consecrate him and no other”. Thus the pope, on rising, immediately ordered early in the morning that all the people with the man who was to be consecrated be let in» (original translation in Italian by M. Pierpaoli). Sixtus III is depicted seated on the bishop’s throne where he has the vision of Peter who appears in the clouds and indicates the young man kneeling at his feet while Saint Apollinaris rests his right hand on the shoulder of Chrysologus. A final interesting reference to the figure of Apollinaris, although indirect, consists of a small fragment of mosaic depicting a servant of the Saint, caught in the moment of sealing the tomb of the first bishop. Together with five other surviving fragments of mosaics, it was part of the opulent iconographic series that shone in the apse halfdome of the Basilica of Ursus from the beginning of the 12th century to the first half of the 18th century. An eighteenth century engraving is the only graphic evidence, besides literary evidence, by which we know of this medieval iconographic series. With the various themes presented it summarised the life of the first bishop in four significant episodes concluding with two consecutive moments in the saint’s life, the blows that caused his death and his burial.